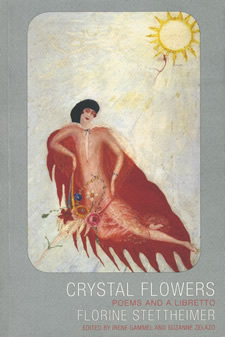 This is a bit unexpected: an edition of the poetry of Florine Stettheimer, best known as a painter, from BookThug, a Canadian press new to me. Over the summer I read her sister Ettie’s novel and became aware of Florine’s poetry, a first published after her death by Ettie in 1949 in a compilation called Crystal Flowers. This turns out to have been impossible to get ahold of because it was published in an edition of 250. This edition, new in November, presents those poems, three additional ones, and the libretto for a ballet; it also wraps them in a fantastic editorial apparatus, with a lengthy introduction, extensive textual notes, a glossary of abbreviations and allusions, and a chronology of her life. Perhaps Florine Stettheimer still isn’t tremendously appealing to the masses: this new version exists, says a note on the text, in an edition of 500, a number that’s painfully small (and perhaps why this isn’t being published by an academic press). But even though not many people will see it, this is still a tremendously useful book, and it deserves some attention. Florine might be the best-documented of the Stettheimer sisters: it turns out that there are a couple of biographies of her, most recently that of Barbara J. Bloemink in 1995, coinciding with a retrospective at the Whitney, but also one from 1963 by Parker Tyler, whose Divine Comedy of Pavel Tchelitchew still sits mostly unread on my shelves. Irene Gammel, one of the editors of this book, wrote a biography of Elsa von Freytag-Loringhoven which I’m always meaning to pick up. This discussion of biography aside, this book is particularly useful because it’s an edition of Florine’s poetry: and while it is well supplemented by biographical elements, this is, first and foremost, a volume of poetry which can finally be read as such. Here one does think of Dickinson: this is undeniably a good poem, and it’s hard to think of anything quite like its terse application of a cheerfully insane metaphor to personal relations. Again the last line kicks, almost anticlimactically in its simple declaration; but it doesn’t solve a riddle so much as start asking questions. This approach isn’t always the one she takes: some of these poems are simply about food, seemingly without a personal component. She starts a poem from the perspective of a pig (“You called me hog”) though her perspective shifts and she seems to end empathizing with a piece of ham: “You changed me completely / Even my name / You called me Ham”. What matters here isn’t that the ham was once part of a pig; it’s the ham’s status as an object, something that can be held in thrall by naming. There’s a temptation to read this as being about Marcel Duchamp, who arranged for a retrospective of Florine Stettheimer’s work at the Museum of Modern Art soon after her death. Duchamp, though he led a transatlantic existence, doesn’t seem to have worn glasses while Florine was still alive: but like her, he was very taken with the idea of glass: “a treasure house / all of glass” could describe either of their work.